Philips State Prison is located in Buford Georgia. 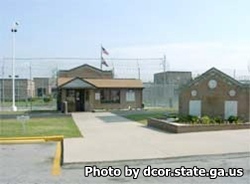 It is a medium security institution that houses 918 adult males who have committed a felony. This facility specializes in housing inmates from other institutions who have behavioral issues and are deemed difficult to manage. Because of this, the facility has 100 isolation cells. The facility also has two man cells, and single cells for the rest of the prison population. Selected inmates may participate in work crews that offer labor for agencies throughout the county. Inmates can also learn a multitude of vocational skills including auto repair and auto body, carpentry, barbering, welding, custodial and building maintenance and food preparation. Inmates can also receive counseling and can participate in religious studies and worship/prayer services offered through the Chaplains office.